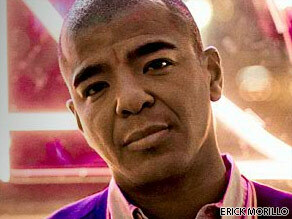 There's not much in the world of music that Erick Morillo hasn't turned his hand to. Erick Morillo is your Connectors of the Day. A platinum selling artist, he's topped the charts as a producer and DJ and has a string of international hits. Morillo is the man behind a huge number of dance floor hits including "Believe" and "I Feel the Love." Raised in the United States, the DJ grew up listening to a mix of latin, reggae and hip-hop music. He started spinning the decks at the age of 11 and from then on, his path was set. Morillo, who's remixed tracks by Whitney Houston and Basement Jaxx, plays at events around the world, from Buenos Aires to Ibiza and Sydney. Right now Morillo is branching out into the world of fashion and is in the early stages of setting up a children's foundation in Colombia. Both an international DJ and a successful businessman, Erick Morillo is your Connector of the Day. Here's your chance to send him your questions - please leave them below and be sure to include where you're writing from. Does it sadden you that although House music has its origins in the United States it has acheived its greatest popularity in Europe in general and the United Kingdom in particular? And do you forsee a time true house music becomes a force on mainstream radio waves in the United States? you are one of the best known artists out there, and i sit in amazement with the type of exhilarating and absolutely peppy music you come out with. What influences you and keeps you going?are there any specific artists,within the north American continent or internationally( or both) which have made a difference in the tunes you create? Are there any specific music styles/ or international music styles which you listen to and get your influences? And the last question, I have seen you 4 times till date( last four years of ultra music festival,Miami..you blew the arena completely), so, the next question is, do you have any plans to come to the middle east, specifically Dubai in the near future. that would make a lot of people happy!! –	What is your opinion on the way Music Entertainment employers are Helping their Artists to manage their Personal Life with their Music and Entertainment work? – What is your opinion on the way Juan Manuel Santos Calderón, the current President of the Republic of Colombia, is handling the Heroin, Cocaine and Marihuana use in the Dark side of the Music World in the Republic of Colombia? –	What is your opinion on Breast Augmentation, Liposuction and Tummy Tuck under Little Children and Teenage Musicians? I am awaiting Erick Morillo’s replies. Greetings from Kingston, Jamaica. What do you think about the current resurgence of "dance" music in the US pop charts? Are things back to the early 90s when club house ruled the airwaves? Can you comment on your live work with Tommy Lee? Do you see much of a future in this sort of Live PA collaboration with various artists, industry-wide, to bring any new freshness or direction to the traditional role of DJ's? How can the impreciseness of live performance have the potential to conflict with the traditional rigid structure of IDM, and how can that be overcome? I don't see that as a big problem with highly skilled professionals, but to have the industry moving in that direction more, the less skilled local DJ's need to be able to make these collaborations sound tight. Just like you, my hometown is also Union City, NJ (4th street pj's). Have you been back to visit recently? The place has certainly changed–Emerson High School combined with Union Hill to form Union City High School. Emerson is now a middle school. Anyway, I'm just a few years younger than you are (and former Emerson Bulldog), and it makes me particularly proud that someone from our upbringing has done so well with his passion. I was wondering–do you have any advice as to how I can increase my name recognition? You obviously DJ on the global level–how would you recommend that I approach venues back home in the NYC versus how I would approach clubs where I am currently staying, Medellin, Colombia? What makes for an effective demo? When auditioning at an attractive place, should DJ's be willing to work for free? How often do you have a set premeditated or do you prefer to react to crowd reaction? What do you think characterizes NY DJ's? (I often get labeled as one when working abroad). I never would have thought that I'd ever read the words "Erick Morillo" and "CNN" in the same sentence! Can it finally be that the U.S. has finally come around and embraced house music? I have my european collegiate rowing teammates to thank for plying me with Erick's music years ago – I've never been able to get enough of it ever since! My house/electronica library has grown over the years, and DJ Erick Morillo's records have always been a staple. – As another fan inquired, do you see a resurgence of dance music and a future interest in house music in the U.S. (case in point David Guetta)? – Do you have any future compilations with mainstream artists planned? Ummm... Dude... Who are you? What are you hoping to accomplish with the children's foundation you are setting up in Colombia? I believe in the healing Power of Music as a Great Instrument to Orchestrate Peace to achieve Tranquility in a Place that we will all share in Harmony and Prosperity. Not that I can play piano all that well, but I have found combining Media, hidden behind the scenes of the Public Eye as interpreter of Opus Machina quite rewarding and uplifting my Spirit when I had an instrument to use. For now I can only spend little time streaming the Energy and The Information given the circumstances such as homelsessness and having been shut out of all ordinary activities that I was uses to having lost my widows benefit due to being homeless. I only hope to get back on my feet someday soon, so I can continue the work that I have begun. First of all I want to congratulate CNN for their outstanding work. Erick, I live in Colombia and am working with a changemakers foundation. We would be very grateful if you could contact us so we can collaborate in any way. Muchas gracias! HOW TRUE IS IT ;MR EVANDER PAYS ALIMONY TO NINE WOMEN.HOW TRUE IS IT?I HEARD IT LONG AGO AND AM STILL CURIOUS TO KNOW THE TRUTH. Erick how much time do you spend in the air? you are my favorite all time DJ. i hope to see you in ibiza soon. heyy erick! dude i got every Subliminal Session Album that you've put out brother! Loco Your like an idol to me! And I follow up to all your current news! I wish i get to meet you one day and person just to tell you how freaking good you are! All my friends and even me think your a god in house/dance music! Cuidate hermano!